Are you coming to take a holiday or an extended business trip in New York City? Williamsburg is the new NYC Vacation spot for the globetrotting young and hip. The coolest bars, restaurants, galleries and shopping in NYC in a smart safe convenient neighborhood. Just a 4 minute walk to famous Bedford Avenue L subway station (one stop from Manhattan's East Village). Fully furnished 1800's landmark brownstone with sleeping areas on 3 separate floors, 2.5 baths, Gorgeous Wood Floors, Full Gourmet Kitchen and a Huge Brooklyn Backyard on a quiet and safe historic street in the heart of it all. You are literally 2 minutes from everything in the neighborhood, and you are closer to downtown Manhattan (Soho, Village, Tribeca), than if you stayed in a hotel in Midtown Manhattan, no kidding. 10 minutes to Manhattan on the subway including your walk. The subway ride is actually just 2 and half minutes. The house is just one block from the Apple Store, one block from Whole Foods Market, and half a block from Citi Bike Rental. Great Heat, Quiet Air Conditioning, Cable, Wi-Fi, Laundry, well-equipped kitchen, in other words, a VERY comfortable, clean and well-maintained house. 1. Absolutely No Smoking, No Drugs, No Wild or Loud Parties. 2. Enjoy the most happening NYC neighborhood at a great price. The house is beautiful - three story brownstone, comfortable, and Daniel is a great host who met us on the first evening to brief us on the house itself and the neighbourhood. 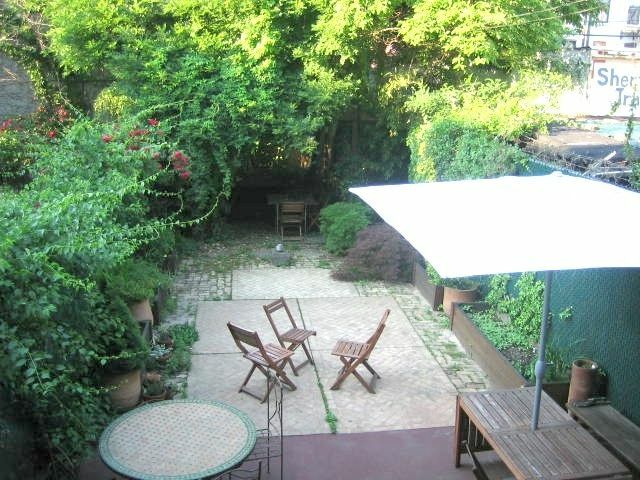 The location is so convenient - right in the middle of Williamsburg with cafes, bars, restaurants, cinemas, supermarkets and subway within minutes of the house. Great as a base to explore Brooklyn and very easy to get to Manhattan. Would highly recommend. Beautiful Brooklyn Base for NYC! This triplex apartment occupying all apart from the basement of this brownstone house provides spacious accommodation in a house full of character decorated in a Moroccan theme. Very well equipped kitchen if you fancy cooking. The location is great - very close to numerous bars, restaurants, shops and the subway (very easy to get to and from Manhattan). Would recommend 'Juliette' and also 'Cafe Mogador' for breakfast/brunch. Try and make time for visiting Smorgasburg - only a short walk away, fantastic selection of food in a park with great views of Manhattan. Daniel was a great host - very helpful with queries and easy to contact. Highly recommended. Loved our stay in Daniel's home, he was very accommodating both leading up to the stay and during. The.heating was fine but Check your sleeping needs, it was too cold.to sleep downstairs on our last 3 nights, (to be fair we were in NY at Christmas time but increasing the thermostat would have made it to hot on the top floor) we were able to get our 3 adult sons on the 2nd level but larger parties would struggle. The subway was very handy and the local shoping and local bars were very cool, we felt safe and comfortable walking around the neighbourhood , the street art was somthing else but it was the access to evrything that was the key to this home for us, would recommend to all.traveling Aussie's so easy to get to and from Fillmore place. Daniel's house is perfectly located on a nice and quiet street, with all kinds of shops, restaurants, bakeries and bars just around the corner. From the house we could walk everywhere, and it took us roughly 40 minutes to reach Manhattan. The house is beautifully decorated, tidy and clean, and you truly feel 'at home'; large bedrooms and bathrooms, beautiful living room, a very nice and well equipped kitchen and a garden full of herbs! We spent a week there, the perfect vacation, together with our grown-up kids and their partners. We enjoyed relaxing and cooking in the house, we enjoyed Williamsburg and our daily excursions to Manhattan. Very nice we felt right at home. We have a strict 6 night minimum, and we give priority to stays that are OVER 7 nights. We do not accept stays of 1, 2, 3, 4 or 5 nights.